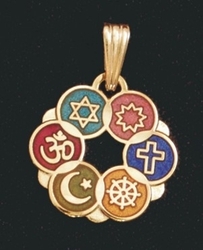 These classic Interfaith Pendants come in two options: gold-plated and multicolor on gold-plating. Measuring 3/4" in diameter, both pendant options come without a chain so you can use the favorite one you already have! Sophisticated and versatile, these pendants makes a lovely gifts as well as being worn during religious ceremonies. 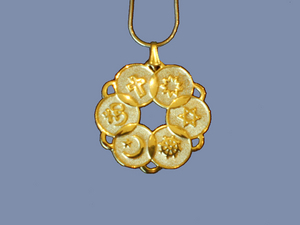 The Interfaith Pendant is a clean and simple design for expressing your commitment to the understanding between faiths. Our Interfaith Pendants with their beautiful rosette design include the symbols of: Christianity, Baha'i, Judaism, Buddhism, Islam and Hinduism. You can choose between either the gold-plated or multicolored on a gold-plated backing. Pick one and buy the other for a friend.